A lack of access to trade finance is a barrier preventing small business from making the most of the opportunities that trade provides and it demands our urgent attention. Trade financing is an essential tool to enable the trade of goods and—increasingly—services, allowing local firms and value chains to sell into global markets. A comprehensive digital transformation of trade will not be successful until all major links in the value chain collaborate. Providing essential data on trade and receivables finance, ICC’s Global Survey plays a crucial role in building transparency so that together our industry can act to close global trade finance gaps. Digitalisation in the trade finance sector will boost economic growth and sustainable development. Digitalisation will make trade more inclusive. We need to do everything we can now to stimulate growth. Trade finance is an obvious place for policymakers to start. Where will future gains come from? Protectionism, transformative technologies, shifting economic trends… Trade and trade finance are in a state of global uncertainty. So where are banks looking to secure future growth? Please indicate what you consider to be the priority areas of development and strategic focus for your bank in terms of growth and evolution in the financing of international trade? From new regulatory regimes to fintech disruption, what do banks see as the biggest obstacles to future trade finance growth? Going digital: Where are we at? From Big Data to blockchain, everyone agrees that digital technologies hold immense transformative potential for the global trade finance industry, which remains largely paper-based. Looking at the reality on the ground, though, how far along are banks in their digital transformation? While progress is being made towards digitalisation, document verification is a notable laggard when it comes to removing the use of physical paper. Q10. To what extent has your bank removed the use of physical paper for documentary transactions? While only 12% of respondents have successfully implemented technology solutions in their trade finance operations—and only 9% have found the solutions to increase efficiency—the Global Survey results show clear movement towards greater digitalisation. Q12a. Please indicate the maturity of your organization in using technology solution to achieve benefits such as reduced time and costs as well as improved associated with trade related due diligence? Unmet demand for trade finance leads to a loss of economic growth and global trade, but the international community is stepping up efforts and working together to improve trade finance. The global economic recovery is hardy by many measures. But economists see many risks in the not-too-distant future, and much remains to be done to capture the jobs of the future. Economists from the World Bank give their own views. Global trade and supply chains/Growing anew, but for how long? Global trade may be flowing faster but anti- trade rhetoric could have an impact. 3 scenarios to forecast trade and trade finance evolution. Commodities are attractive again to investors. But the effects of depressed prices in 2015 are lingering. Governments are helping to bridge the gulf in trade finance, especially in developing countries, evidenced by recent declarations on financing for development and to expand trade finance support for under-served groups, such as women. An analysis of the wider context for trade finance and supply chain finance based on responses gathered from 251 banks across 91 countries and a total US$9 trillion of trade finance processed. The SWIFT interbank payment system offers a bird’s eye view of global trade activity in the last year. It also reveals upcoming changes in messaging standards for trade finance. A total of 65 senior professionals share their views in the annual TXF-ICC survey on the export finance market on a range of measures. 2017 was a good year for underwriters of export credit and investment insurance, but the current environment for political risks remains delicate. A deep dive deep dive into the trade finance activities of multilateral development banks – and what’s in the pipeline. The public and interested parties must understand that a more proportional regulatory regime for trade finance will boost economic growth and not backtrack on the hard-won safeguards put in place to prevent another financial crisis. Remedies to make trade finance really catch on as an investment. There are three new methods to more efficiently deal with all the new regulations on money laundering, terrorist financing and sanctions. As regulations get ever stricter, increasing time and resources required, organisations can get more efficient in pinpointing which cases to pursue, by following suggested actions. Basel IV/ Will new rules help or harm the market for trade finance? An explanation of the new requirements under Basel IV, the wider ambition of the reformed standards, and how trade finance will be affected by these. Two of the world’s experts on ethical regulation spell out the state of play in curbing corporate malfeasance and offer a new way forward. A call to action for collaboration addressed at the trade finance industry, as it sits on the cusp of a digital revolution. The growth experienced and further anticipated by banks in terms of value of trade finance and supply chyain finance processed needs to be sustainable. Early indications show the trade finance industry could make big savings in time and staffing today, through methods such as Robotic Process Automation, and blockchain is quickly turning into a commercially viable proposition. But the hurdles to an all-digital strategy may be more political than technical. ICC’s working group on digitisation gives an overview of where things stand on developing minimum standards for digital connectivity, electronic documents, on the shelf solutions, and cutting edge technology. Why banks need to take a hard look at their policies, procedures and exposure – and tread carefully in using electronic contracts. Forfaiting may help solve the problems getting in the way of commercialising distributed ledger technology (DLT). A new ICC working group on sustainable finance started in 2016 is looking into standards, a due diligence tool, and ways to spread best practices. Consumers are getting savvier about the carbon footprint of the products they buy – a big reason for the growth in voluntary sustainability standards – but several problems need to be solved on the use of voluntary sustainability standards. Singapore lays out its vision for a globally connected, digitized world for trade and trade finance. China’s trade finance market has some unique features, and the country is moving forward with novel ways to fund e-commerce. SINOSURE view/ What’s driving China’s galloping growth in trade finance? Amid a transformation of China’s foreign trade structure, SINOSURE is providing risk coverage as the country transitions to an innovation-led economy. Published annually, the ICC Banking Commission’s Global Survey report is an unparalleled look into the global trade finance industry. Based on exclusive information from over 250 banks in more than 90 countries, the Global Survey offers invaluable perspectives on challenges and opportunities in the trade finance industry from the practitioners themselves. The survey results are bolstered by contributions from an international array of leading voices on trade, including experts from the World Bank, Boston Consulting Group and the World Trade Organization. 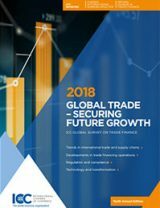 Download "Global trade: Securing future growth"
In order to download the report Global Trade – Securing Growth, ICC asks that you consent to provide certain personal information that will allow us to gain insight into the audiences that we are addressing with this report. Fields marked with an asterisk are mandatory. This information will be analysed by ICC’s internal teams to better orient future editions or to engage with you on future Banking Commission projects and will not be shared with any ICC affiliates or with any third parties. This information will be held for a maximum of two years before it is deleted. In accordance with laws on the protection of personal data, you have a right to request from ICC, as data controller, access, rectification, erasure of personal data, and restriction or objection to processing, as well as the right to provide indications as to your data’s fate after death. Further details are available here. You can exercise your rights by sending a request to icc_connect@iccwbo.org or to ICC, Data protection, 33-43 avenue du Président Wilson 75116 Paris France, with an copy of a photo ID. You also have the right to lodge a complaint with the French supervisory authority, CNIL. Note: The download link in your email is unique, please don’t share it further. We recommend you save the report in your local files, as you can only download it once with this link.